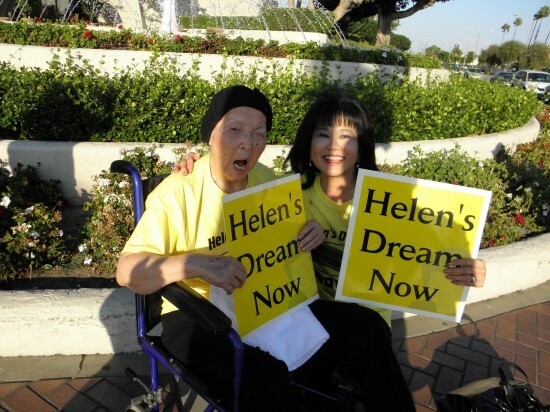 CARSON — The Helen’s Dream Coalition held a rally outside Carson City Hall on Sept. 4, again demanding that the City Council Chambers be named after former City Clerk Helen Kawagoe immediately. This is the second time the group has picketed, but this time Kawagoe herself was among those holding up placards. After serving as the elected city clerk for more than 37 years, Kawagoe suffered a debilitating stroke a year ago and had to step down. She now lives at South Bay Keiro in Gardena and just turned 85 on Aug. 30. Looking very different from her official portrait and sitting in a wheelchair with her daughter, Sheryl Miyamoto, by her side, Kawagoe was surrounded by friends who were protesting the City Council’s 3-2 decision earlier this year to rename the chambers after Kawagoe’s passing. The council majority maintains that it is against city policy to honor a living person in this manner. Wearing yellow T-shirts reading “Helen’s Dream Now,” coalition members attended that evening’s council meeting and spoke during the public comment period. 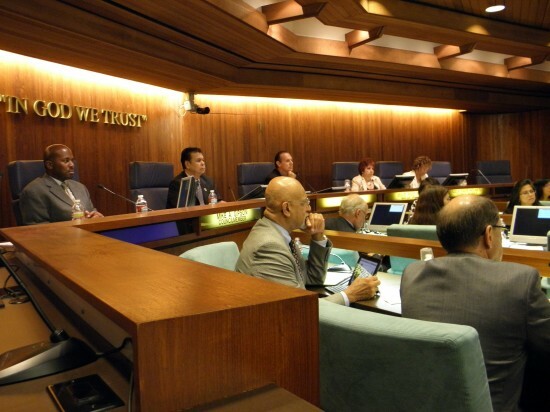 Most were harshly critical of Mayor Pro Tem Julie Ruiz-Raber, Councilmember Lula Davis-Holmes and Councilmember Mike Gipson, who are at odds with Mayor Jim Dear and Councilmember Elito Santarina over the renaming issue. Dear, who welcomed Kawagoe to the chambers, called the council majority “cold-hearted” for not granting her wish and accused them of misrepresenting his position at various public events. He stated for the record that he sides with the coalition. There were also acrimonious exchanges among the council members and city staff over how many coalition members would be allowed to speak. Although no further action by the council is scheduled, the coalition plans to keep the issue alive and hopes to change the mind of at least one of the three councilmembers who voted to honor Kawagoe posthumously. I’m one of Helen Kawagoe’s “Dreamers” & want to thank Rafu Shimpo for their coverage of this issue. 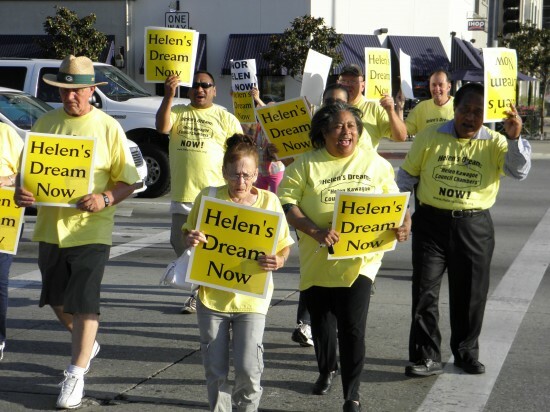 I hope that everyone of your readers in the Carson area takes up Helen’s cause. If the 3 self-serving and petty council members can do this to someone like Helen, who provided Carson with 4 decades of distinguished service, just think of how they will treat the average, hard-working resident. It was Helen Kawagoe, herself, who requested that the Council Chambers be named in her honor following a severe stroke that necessitated her retirement after nearly 40 years of public service. The residents of Carson have joined to be her “voice” but we are being ignored and disrespected by those we put in office to represent us. Helen’s request is not a political issue and the naming of the Chambers should come from the heart . Rather, it appears that the vindictiveness of some council members amongst themselves and towards the mayor will prevent Helen from seeing her dream come true. Let’s us not forget when it is election time for mayor and/or council members.